Claims Consortium Group has led some ground-breaking IT developments that started in – and have reached far beyond – the insurance sector. Our workflow technology business, like our claims handling services, is driven by a dedication to the customer experience. The customer is firmly at the heart of our software developments, and this is for good reason. By working towards giving customers an exceptional experience, the business users of our technology benefit in many ways – efficiency, synergies, cost savings, and customer retention. Our approach is multi-faceted. Firstly our technologies have embraced social media. Our increasingly ‘on-demand’ society expects companies to be accessible 24 hours a day. They want to be able to communicate with them online. This impacts all customer-facing businesses, and we have responded with our TrackMyClaim® and Synergy® platforms. Secondly these technologies move away from a silo approach and into a multi-user environment. In a silo structure people and organisations tend to work in isolation; information is only shared if it has to be, and no one is able to make independent decisions based on all the data available. This can lead to confusion, inefficiency and bad decisions. With our multi-user approach, the software holds all the data centrally and gives all parties real-time access to relevant, tailored information. We build technical innovations that maximise the ability for service providers to collaborate, and for them to engage with insurers, brokers and other property service organisations. We are focused on developing our Synergy® and TrackMyClaim® platforms and fully supporting their operation on a 24-hour day-to-day basis. 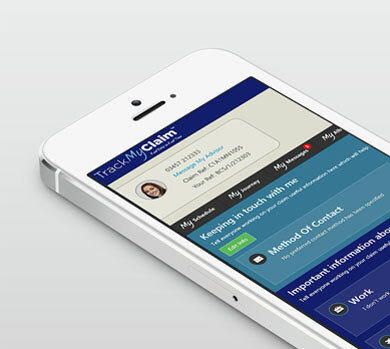 Our TrackMyClaim® platform is available to all insurers’ customers – the policyholders – to track and manage the progress of claims and repairs in real time. Hundreds of customers use our portal or messaging app every day in the UK. Our Synergy® platform brings all parties in a claim together to create efficiencies, reduce the claims lifecycle and improve customer service. Synergy® has been adopted by some of the leading insurers and service providers in the UK. Our technologies are stand-alone, or can be integrated with proprietary or third-party software for a ‘big data’ approach to handling information and analytics. Support the internal digital strategy. Know who is doing the work.